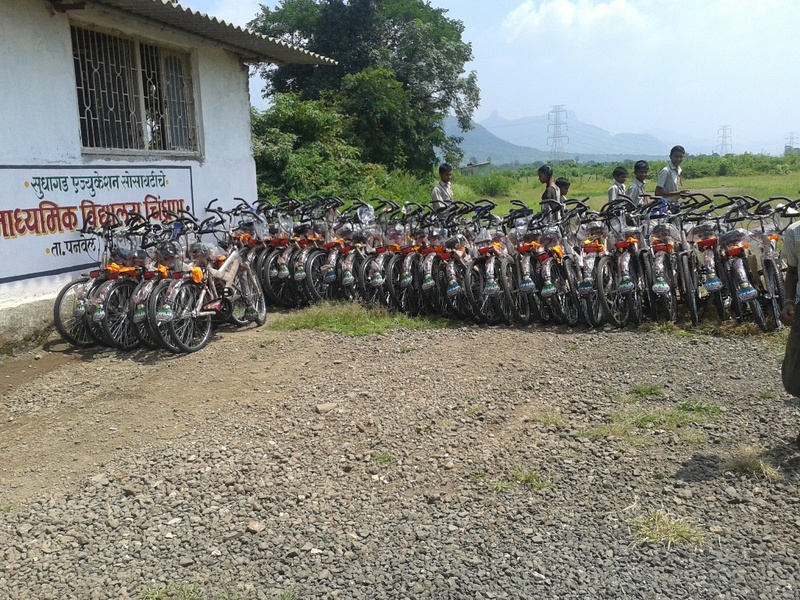 Indian Development Foundation (IDF) team comprising Dr. Ark Pillai, Prof. Prajesh Trotsky and Mr. Shantilal Gada distributed bicycles to 50 needy and poor students of Sudhagad Education Society’s Secondary School at Chindran village, Panvel, Maharashtra. 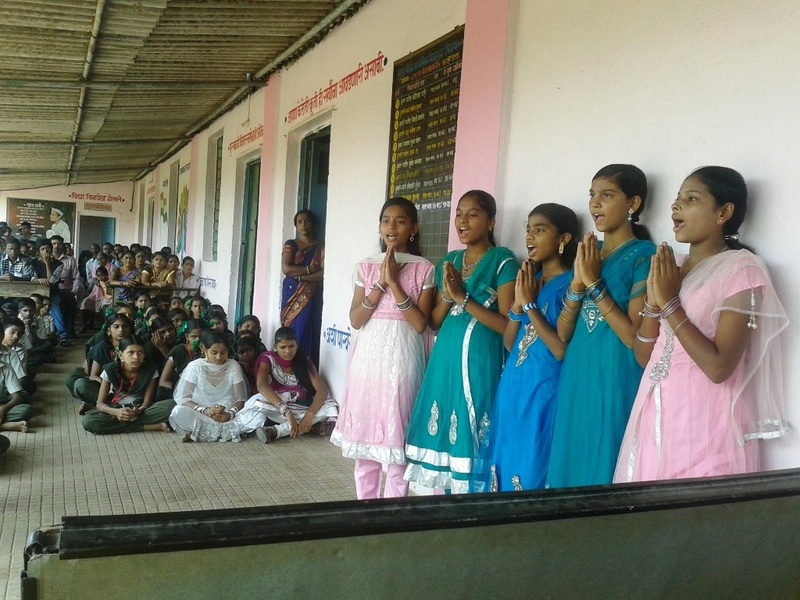 IDF runs Tilak Bal Gurukul at SES School. The entire school project was taken up by IDF and provided electricity, sanitation and water in June 2012 and the bicycle project got completed on 27-09-12. Those children walking for 14 kms per day (7+7) were gifted with a bicycle to save time for education. You support, IDF will do the rest !!! ഷിക്കാഗോ: ഇന്ത്യന്‍ ഡെവലപ്‌മെന്റ്‌ ഫൗണ്ടേഷന്റെ (ഐ.ഡി.എഫ്‌) സ്ഥാപക പ്രസിഡന്റായ ഡോ. എ.ആര്‍.കെ പിള്ളയും, ഐ.ഡി.എഫിന്റെ സി.ഇ.ഒയും നാഷണല്‍ കോര്‍ഡിനേറ്ററുമായ ഡോ. നാരായണ്‍ അയ്യരും 2012 ഒക്‌ടോബറില്‍ അമേരിക്കന്‍ സന്ദര്‍ശത്തിനായി എത്തിച്ചേരും. ഷിക്കാഗോ, സാന്‍ജോസ്‌, ഡിട്രോയിറ്റ്‌, ന്യൂയോര്‍ക്ക്‌ എന്നീ നഗരങ്ങളാവും അവര്‍ സന്ദര്‍ശിക്കുക. Indian Development Foundation (IDF), formerly Indian Leprosy Foundation, plans to increase its ‘Bal Gurukuls’ under its poor children’s elementary education programme scheme across the country from 93 to 500 in the next two years, said A.R.K. Pillai, president of IDF here on Tuesday. Mr. Pillai was addressing a gathering at an IDF award distribution function 2011-12 under Resource Generation for humanitarian causes at Don Bosco High School in the city. Students and teachers of different schools such as Don Bosco High School, Red Rosary High School, Miramar, and Sharada Mandir, Miramar, were given awards for excellence in resource generation. 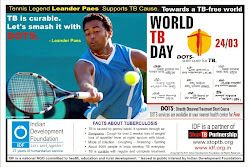 Pradeep Korgaonkar, Chief Medical Officer, TB Control Programme, Uday Gaonkar, and Rajiv Phadke were present. “In elementary education for the children of rag-pickers and similar neglected lot and stray children, we have found a method to remove this barrier by opening up ‘Education Programmes’ or ‘Bal Gurukuls’. 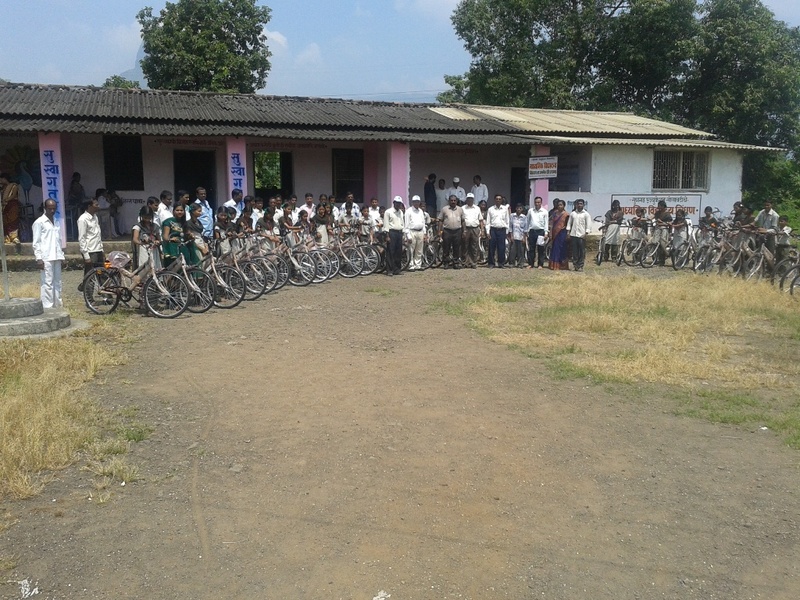 From a beginning of five students in a tribal area of Karjat, IDF now covers over 6,000 students from Kanayakumari to Ladakh under this empowerment programme,” said Mr. Pillai. IDF’s focus continues to be on health with 120 hospitals involved in the programme. IDF to launch iLIFT to give a lift in life for the young minds. The launch will be on 27-09-2012 at Tanishq, Linking Road, Andheri (West), Mumbai at 4:00 PM. The first batch will be for students from various colleges in Mumbai who will be trained on leadership skills and they in-turn will share leadership knowledge with students in various schools and colleges. 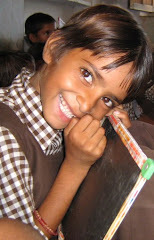 The whole process is to enlighten the young minds in India. Dr. ARK Pillai, Prof. Anil Shivdasan and Prof. Prajesh Trotsky will take the lead at the launch. More faculties to join hands soon and take the iLIFT programme to different parts of India. Indian Development Foundation in collaboration with Prarambh Foundation launched Sarva Sakhi Swabhiman - a women empowerment project in Batta Basti, near Shastri Nagar, Jaipur on 11-09-2012. IDF team comprising - Dr.ARK Pillai, Rtn. Aunali Rupani, Dr. Narayan Iyer, Mr. Kovid Oli, Mr. Simon Peter and Mr. Aryaman Pandey - were present at the site to launch the mega project. Mr. Sandeep Edwin from Prarambh Foundation thanked IDF team. The women felt extremely happy as they will be inducted in education, vocational training and financial literacy programmes. IDF committed to bring smiles on many lives !!! Indian Development Foundation (IDF) organised an Award Function to felicitate the schools and students who have done excellent social performance during 2011-12. The schoolteam had supported leprosy/ TB and education projects. IDF team comprising - Dr. ARK. Pillai, Dr. S. Franklin, Mr. CA Mathew and Mr. Rajiv Phadke congratulated the award winners and appreciated the social action and support by the students. 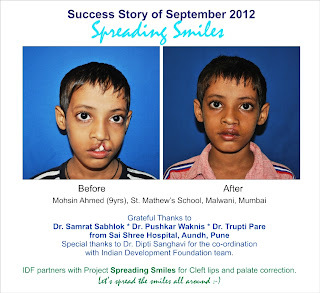 Grateful Thanks to Dr. Samrat Sabhlok, Dr. Pushkar Waknis, Dr. Trupti Pare and Dr. Dipti Sanghavi for all the wonderful support in spreading smiles. IDF partners with Project Spreading Smiles in cleft lips and palate correction. The journey of goodness continues. 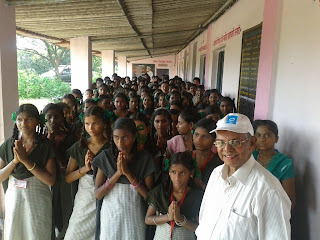 IDF's "Sarva Sakhi Swabhiman" (Project S-3) - A Women Empowerment Programme was launched at St. Thomas Mar Thoma High School, Pathanwadi, Malad (East), Mumbai on 31st August 2012. A group of women got enrolled for education, vocational training, financial literacy and basic health and social awareness. 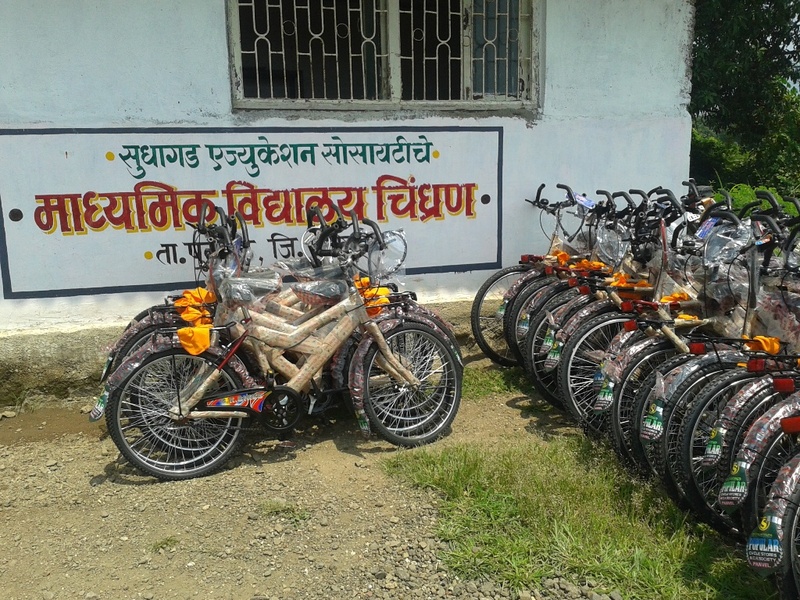 A team of committed teachers will take up the project to empower the women in a phased manner. Indian Development Foundation (IDF) will soon launch several S-3 projects in different parts of India. IDF is committed to Educate, Empower and Enrich the needy. IDF team comprising - Dr.ARK Pillai, Dr. Narayan Iyer and Mr.Vikas Gill - addressed the students and Teachers of St.Thomas School, Indirapuram, Ghaziabad (UP) on 14-09-2012 on IDF's social programmes. Rev. Fr. Saji Yohannan, Chairman, Mr. V.K. Kuriakose, Principal, Ms. Shali Nai, Vice Principal and the School Xpression magazine leaders - Sachin - Nandita - Aparna - appreciated the work of IDF and handed over a handsome of voluntary contributions to IDF. Our thanks and salutations. P.S. Aparna, Sachin K.S. and Nandita Tailor spoke on goodness mantra. Students from St. Thomas School, Indirapuram, Ghaziabad (UP) speaking on goodness and students' participation in social responsibility programmes. St. Thomas School Team under the able leadership of Rev. Fr. Saji Yohannan (Chairman), Mr. V.K. Kuriakose (Principal) and Mrs. Shali Nair (Vice-Principal) presented a handsome contribution for leprosy/ TB and education project of Indian Development Foundation. IDF conveys special thanks St.Thomas School Team. 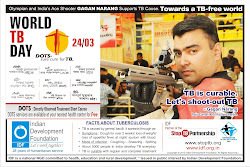 IDF team comprising - Dr.ARK Pillai, Rtn. Aunali Rupani, Dr. Narayan Iyer, Mr. Simon Peter, Mr. Kovid Oli and Mr. Aryaman Chetas - visited Prarambh Bal Gurukul at Jaipur on 11-09-12. The students in PBG felt extremely happy and thanked IDF and Prarambh Foundation team for providing necessary assistance from time to time. IDF is committed to spread smiles on million lives. IDF Grants - Awards Function for northern region was held at Bhavan's Maharana Pratap Auditorium, Jaipur on 10th Sept. 2012. Hon. Shri Brij Kishor Sharma, Minister for Education, Govt. of Rajasthan - Hon. Dr. B.D.Kalla, Chairman, Finance Commission, Rajasthan were the distinguished invitees. Guests of Honour - Shri O.P. 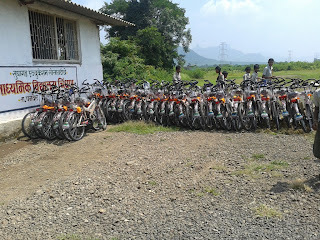 Dargar, Shri. P.D.Singh, Dr. N. C. Lunayach, Dr. Balwant Singh Chirana, Capt. 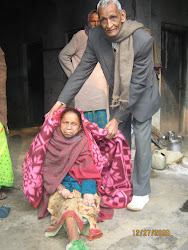 (IN) Alokesh Sen, Mrs. Renu Sehgal, Rtn. Aunali Rupani and Shri Suresh Kaul - congratulated IDF-SMK partnership for social programmes in Rajasthan. Dr.ARK Pillai thanked the people of Rajasthan for their constant support. IDF Grants to Northern Region and Awards and Honours to Schools for peak performance in social work in 2011-12 were presented. IDF to launch its 92nd Bal Gurukul in Leh, Ladakh, Jammu & Kashmir on 09-09-12. Capt. Balasubramanian, Trustee, IDF met Dr. Tsering Palmo, Director of Ladakh Nuns Association this morning and apprised about IDF work and IDF Bal Gurukul programmes across India. A proposal to start a Bal Gurukul in collaboration with LNA was immediately accepted. Team LNA will co-ordinate and monitor the Bal Gurukul programme. Seeking your blessings and best wishes !!! IDF Social Ambassador Ms.Preetha, specialist in nutrition and food management organised a special session for the students of 4 IDF Bal Gurukuls in Malwani, Malad, Mumbai on 08-09-2012. 55 girl students of class 8 and 9 from Holy Mother School, Gurukul School, Sir J.R. School and Bharatmata School participated in the special food for thought programme and learnt the tips of making food. Ms. Preetha scientifically explained the methods of cooking from hygiene to presentation point and also the nutrition levels for healthy life. 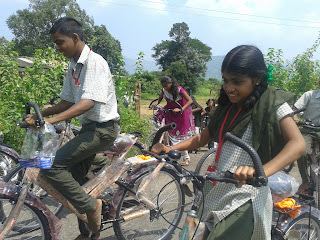 The students learnt a variety of recipes/ tiffin menu which they can carry to their school. 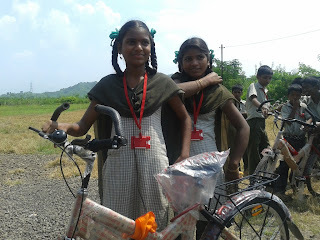 The girls felt happy as they could extend a helping hand to their mothers at home. The Principals of the schools expressed sincere thanks to Ms.Preetha for organising a healthy session for their students. Many such interesting sessions to follow for better health of students. Shri Om Prakash Dargar, President of Shri Maheshwari Samaj, Jaipur and The Education Committee of the Maheshwari Samaj appreciated the work of Indian Development Foundation. Dr. Ark Pillai and Dr. Narayan Iyer called on Shri O.P. 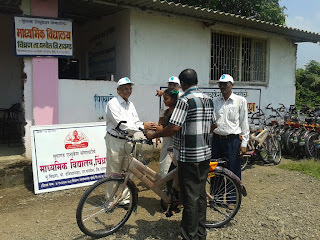 Dargar at Jaipur on 06-09-2012 and apprised on the humanitarian programmes of the Foundation. Ms.Neelam Wallia, Principal of Maheshwari Public School, Jaipur congratulated team IDF for the excellent social responsibility initiatives in Rajasthan. on the occasion of Teachers Day at BKC, Bandra,Mumbai. Perfect session by Prof. Prajesh Trotsky....... Jai ho !!! Thanks to SCB Social Champions for helping the cause. T3 - Train The Trainers to empower the young minds. Creating new teachers on the Teachers Day. IDF-T3 will be launched today. IDF social ambassadors - Mr.Anil Shivdasan and Prof. Prajesh Trotsky will launch IDF-T3 in collaboration with Standard Chartered Bank (SCB) at Bandra, Mumbai. A group of executives in SCB will be trained by IDF social ambassadors for empowering students in slum schools in Mumbai. Topics like personality development, public speaking, leadership and other soft skill inputs in the level of teacher-student pattern will be imparted. Our target is to cater to 30,000 students in the first phase and once the model becomes successful, we will take up to different parts of India. We invite many volunteers join hands with IDF and empower young minds. IDF Social Ambassador Mrs.Chetna Bhatia called on Rev. Fr. Luigi Pezzoni at Leprosy Health. Centre, Duppalapalli Road, Nalgonda,. Andhra Pradesh. The octogenarian Rev. Fr. Luigi Pezzoni, crusader of leprosy for four decades, congratulated Mrs. Chetna Bhatia as he received the copy of `Hope on the Horizon' (biography of Dr.Ark Pillai). We recall with pleasure the support extended by Rev. Fr. Luigi for leprosy work. Our salutations and good wishes to Fr. Luigi for his relentless social work. IDF team thank Mrs. Chetna Bhatia in re-establishing the goodness relation. Glenn Joseph during his last visit to India (2011) had travelled to IDF projects in Jaipur, Panvel and Malwani. 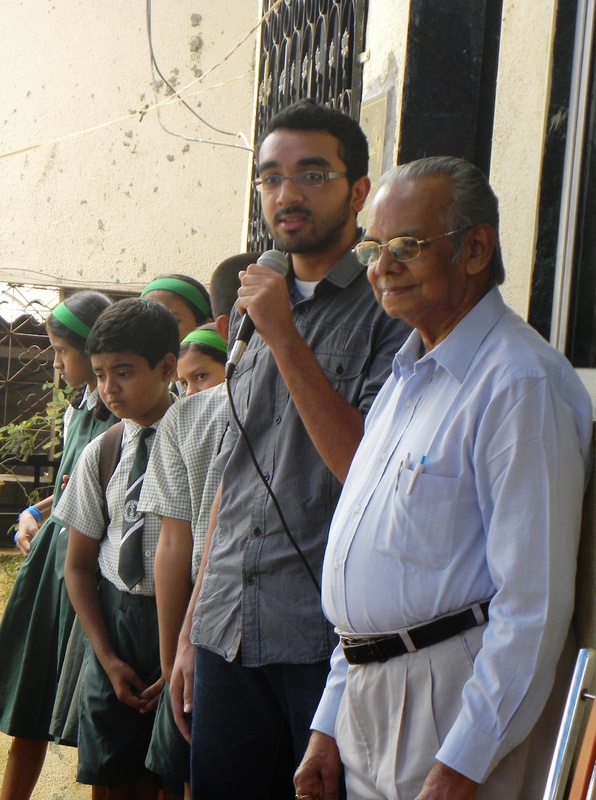 He was touched by the wonderful speeches delivered by Siddique Vasi and Fehmida Mustakin in a Malwani School in Mumbai. The difficult situations of children in Panvel was witnessed by him and also the joyful children in IDF's Tilak Bal Gurukul in Papad village in Jaipur made him happy. Glenn has been observing his father, Cecil O Joseph's commitment to IDF's social programmes and had also heard about his involvement in leprosy programme from childhood days. All these inspired Glenn to donate a part amount of his first pay received for a noble cause. Dr. Ark Pillai in his personal note appreciated Glenn's goodness and also thanked his parents and the whole family for giving him the right values of life. IDF wishes Glenn best of life ahead as he enters into his career path. IDF promotes goodness unlimited. Join hands with IDF and feel the difference !!! Goodness Unlimited from St. Joseph's Convent High School, Vile Parle (W), Mumbai. 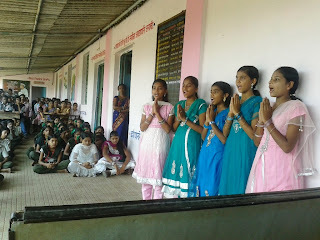 IDF's "Sarva Sakhi Swabhiman" - A Women Empowerment Programme was launched at St. Thomas Mar Thoma High School, Pathanwadi, Malad (East), Mumbai on 31st August 2012. A group of women got enrolled for education, vocational training, financial literacy and basic health and social awareness. 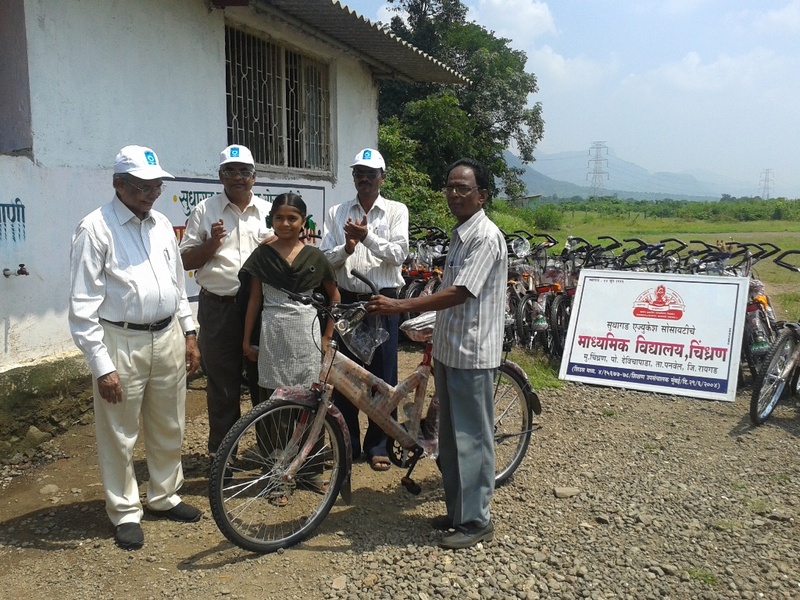 A team of committed teachers will take up the project to empower the women in a phased manner. IDF will soon launch several S3 projects in different parts of India. IDF is committed to Educate, Empower and Enrich the needy.